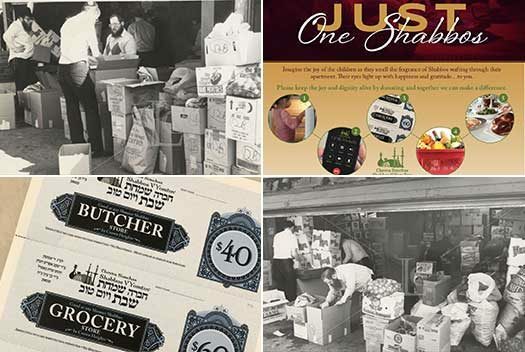 Chevra Simchas Shabbos V’Yom Tov – CSSY – the premier Tzadakah of Crown Heights, is running a summer campaign called “ Just One Shabbos” asking the community to sponsor at least one Shabbos for a Crown Heights family. While many are Baruch HaShem fortunate to go up to the mountains, send kids to camp and enjoy their summer; others are not so lucky. For over 150 families in our community summer is a time to cringe. You may not know that some families rely on their local schools for their children’s breakfast and lunch and in the summer that is an extra financial burden they can’t afford. Some rely on friends and family to invite them out for Shabbos meal, but in the summer they are left alone to feed their families. 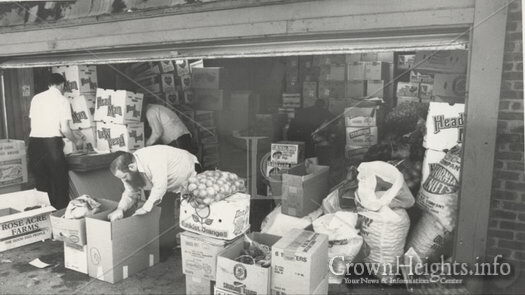 Many families struggle to make ends meet and may not have money for food, AC, gas, electric or other necessities. These are YOUR family members, YOUR neighbors, YOUR friends, and YOUR community! They need you! CSSY will never provide the names or pictures of the recipients because THEY ARE PEOPLE YOU KNOW! 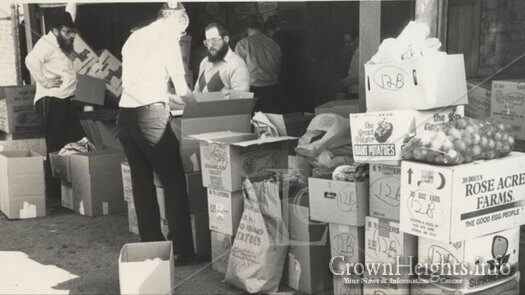 CSSY began 40 years ago in the garage of Shimshon and Martha Stock distributing food packages for Shabbos and Yom Tov. 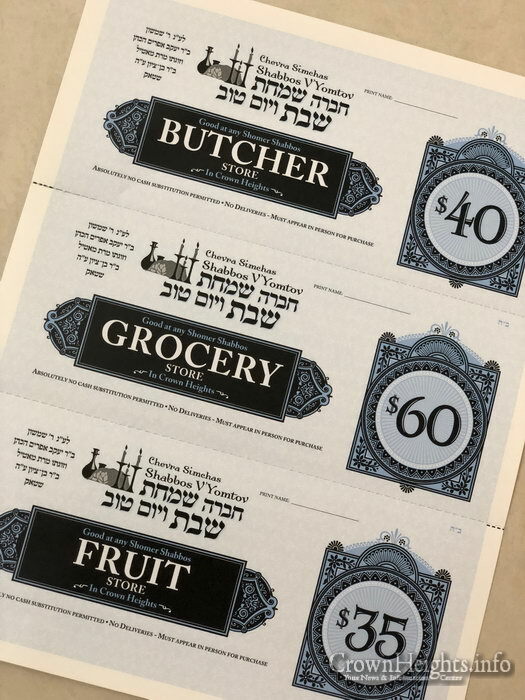 Today CSSY distributes thousands of dollars in food vouchers and other funds each week to assist the poor and needy in our Crown Heights community. 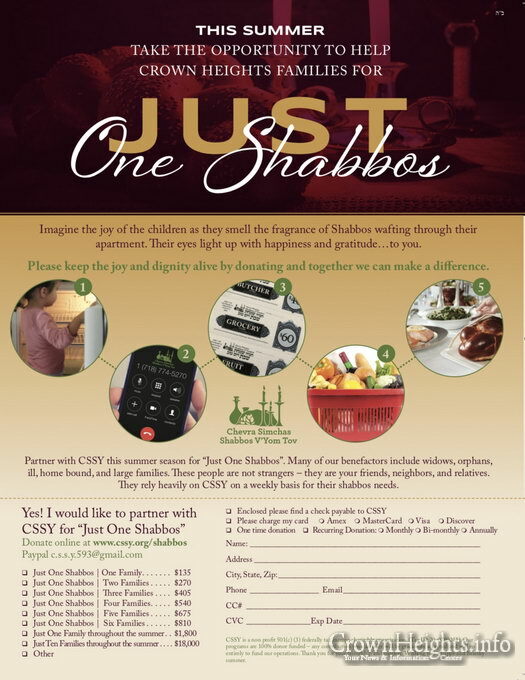 Please make life easier for these families Crown Heights families by sponsoring “Just One Shabbos” (or more)! May we be zoche that from “Just one Shabbos” of Tzedakah we go to “Just one Shabbos and we’ll all be free” from Golus and these days will turn from sadness to joy! Bekorov Mamosh! Amazing work sponsored by amazing people! But please enough with the “being left alone” in the summer here in Crown Heights or that “they can’t go up to the country”. There are many, many people here in CH in the summer-of all means. It is by no means a necessity to go up to the country, nor does it mean that if one does not go up it is a nebach in any way. The focus should be more to make sure that all families have what to eat, wear and have housing in a bakovodike way, that people are helped to find work, whenever possible, and that children are able to go to schools and camps. So read the article it doesnt say everyone goes up besides the poor… it says while many go up…. Why bother with the tickets? They look like those old food stamps before the EBT cards. 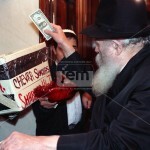 Can’t someone from CSSY just call the butcher, grocer, etc. and let them know that such and such family will be coming in around whatever time to pick up an order? All you’d have to do is show some ID to the manager, pick up the order, and go.